For the past few weeks I have been posting broadband profiles of each county – all 87 of them! I used data from the Office of Broadband Development, based on surveys from July 2016, tracking each counties access to broadband at speeds of 25 Mbps down and 3 up (25/3), which is the 2022 Minnesota state speed goal and access to 100/20, which is the 2026 goal. It’s nice to have a history of how a county has been doing and where they are heading. 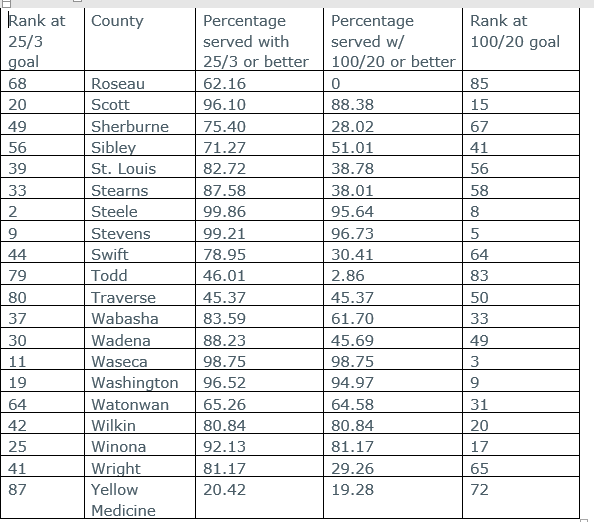 We’re seen some counties (Clearwater) go from least served list of 2010 to more than 99 percent coverage today and 73 percent with access to 100/20. And unfortunately we’ve seen some go the other way too – as the definition of broadband has changed their ranking and percentage of coverage has gone down. These areas need to focus on unserved and underserved areas. In some ways those are the communities I worry about most, the places where it feels like they’re OK today but they aren’t going to be tomorrow. They are like dieters who have hit their goal wait. Maintaining takes work too. Then there are the areas that are unserved – the toughest to reach, the lowest population density, often with providers who need to make business case more aggressive that an area can support to upgrade their connection. Today those folks know they need help. Hopefully folks will find these useful. Thanks to folks who have taken the time to send me corrections and updates. Sheer plod makes plough – but doesn’t always allow for as much proofing as I’d like. In 2014, 26 percent of Yellow Medicine County had access to broadband. (Broadband was defined with lower speeds back then.) Today 82 percent of the county has access to broadband speeds of 25/3 (Mbps down/up) and 29 percent has access to the 2026 speed goals of 100/20. In 2017, Yellow Medicine is partnering with six counties (Lincoln, Murray, Pipestone, Lyon, Yellow Medicine and Chippewa) to do a regional broadband study to determine the feasibility of bringing broadband service to unserved rural areas in the six counties. They have also been partnered with the Upper Minnesota Valley RDC to get grants. Midco, Canby to Marshall Middle Mile and Last Mile in Porter-Taunton-Minneota-Ghent – $623,000. This project will serve 1,029 unserved households, 29 unserved businesses and 11 unserved community institutions in the communities of Porter, Taunton, Minneota, Ghent and Canby in Yellow Medicine and Lyon counties. Midco will improve service levels for 100 percent of the homes and businesses in those areas. The total eligible project costs are $1.6 million, with a $976,000 local match. MVTV Wireless was awarded $808,080 to upgrade backhaul capacity between site locations within 20 southwestern Minnesota counties, including Chippewa, Kandiyohi, Lac qui Parle, Meeker, Redwood, Renville, Swift and Yellow Medicine. Yellow Medicine County is also in line to receive $977,738 in CAF 2 funding to upgrade 1250 locations. CAF 2 recipients are only required to upgrade to 10/1 access. Many may choose to upgrade to better speeds but there are no requirements. DDI score of 55.89 out of 100. 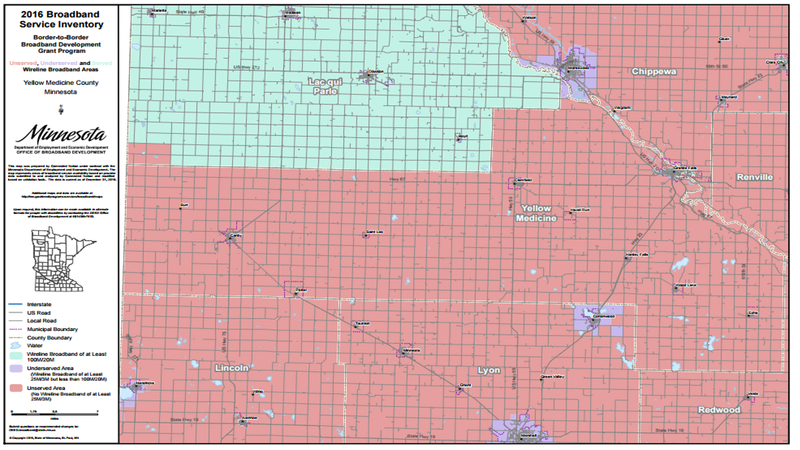 In 2014, 93 percent of Wright County had access to broadband. (Broadband was defined with lower speeds back then.) Today 82 percent of the county has access to broadband speeds of 25/3 (Mbps down/up) and 29 percent has access to the 2026 speed goals of 100/20. But with 29 percent coverage at 206 broadband goal speeds, it looks like the networks have not extended beyond the city much. It would be nice to see the fiber expand. Wright County is in line to receive $2,006,869 in CAF 2 funding to upgrade 5488 locations. CAF 2 recipients are only required to upgrade to 10/1 access. Many may choose to upgrade to better speeds but there are no requirements. DDI score of 16.82 out of 100. 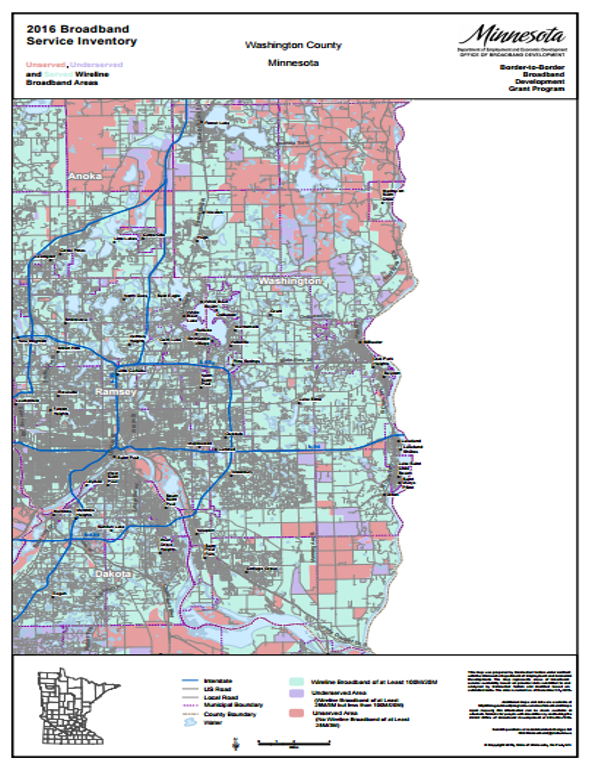 In 2014, 90 percent of Winona County had access to broadband. (Broadband was defined with lower speeds back then.) Today 82 percent of the county has access to broadband speeds of 25/3 (Mbps down/up) and 81 percent has access to the 2026 speed goals of 100/20. the county will get $416,000 to continue broadband expansion into areas of Wilson, Homer, Richmond, Pleasant Hill and Wiscoy townships. The total project cost is estimated to be $868,000, with a match by HBC covering the rest. The project is expected to reach 111 households, 112 unserved businesses, and two community institutions currently unserved or underserved. Winona County administrator Ken Fritz said the county would like to continue using the programs if the state continues providing grants. Last year the county was awarded $314,500 to a project to expand broadband into the Witoka and Wilson areas, with HBC covering the rest of the near $1 million project cost. That project started in spring 2016 and affected an estimated 256 households, 117 businesses, 90 farms, nine commercial and industrial businesses, 18 home-based businesses, a school and other public institutions. In 2015 the county also received $247,000 for broadband expansion in Elba and Norton townships, including Whitewater State Park. The overall project is estimated to cost nearly $775,000. That project will provide improved internet to an estimated 135 households, 70 businesses, Whitewater State Park, Whitewater Wildlife Management Area, Crystal Springs Fish Hatchery, a school and other public institutions. Winona has been an involved community. They were a Minnesota Intelligent Rural Community (Blandin MIRC) community where among other projects they worked with Project FINE to provide digital inclusion training in multiple languages. Last summer (2016), Senator Franken’s team held listening session in the area to discuss broadband. Winona County is also in line to receive $245,212 in CAF 2 funding to upgrade 475 locations. CAF 2 recipients are only required to upgrade to 10/1 access. Many may choose to upgrade to better speeds but there are no requirements. DDI score of 41.93 out of 100. 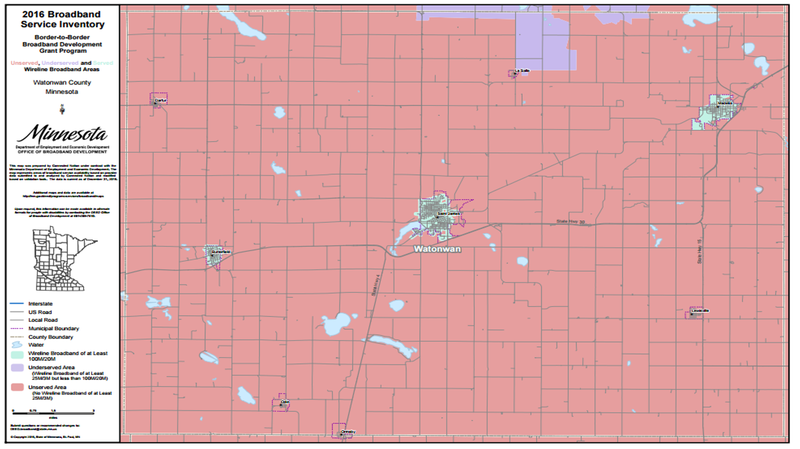 In 2014, 65 percent of Watonwan County had access to broadband. (Broadband was defined with lower speeds back then.) Today 65 percent of the county has access to broadband speeds of 25/3 (Mbps down/up) and 64 percent has access to the 2026 speed goals of 100/20. New Ulm Telecom Inc., Hanska – $200,397. This project will serve 14 unserved households and 32 unserved businesses in Lake Hanska Township in Brown County and Riverdale Township in Watonwan County. New Ulm Telephone will improve service levels in an area populated with farms and home-based businesses. The total eligible project cost is $445,326, with a $244,929 local match. It’s not a huge project but might build a momentum. This project will improve services to 6,000 households and businesses that are MVTV customers in 20 southwestern Minnesota counties, with leverage possibilities for another 29,000 customers. The counties are Blue Earth, Chippewa, Cottonwood, Jackson, Kandiyohi, Lac Qui Parle, Lincoln, Lyon, Meeker, Murray, Nicollet, Nobles, Pipestone, Rock, Redwood, Renville, Sibley, Swift, Watonwan and Yellow Medicine. Total project costs are $1.85 million. MVTV will cover the remaining $1.04 million (56 percent local match). Community and Economic Development Impact: The project will improve broadband access and speeds for more than 3,000 farm-related businesses and 6,000 rural residents across nearly 30,000 square miles. Watonwan County is also in line to receive $679,539 in CAF 2 funding to upgrade 821 locations. CAF 2 recipients are only required to upgrade to 10/1 access. Many may choose to upgrade to better speeds but there are no requirements. DDI score of 49.87 out of 100. In 2014, more than 99 percent of Washington County had access to broadband. (Broadband was defined with lower speeds back then.) Today 96 percent of the county has access to broadband speeds of 25/3 (Mbps down/up) and 94 percent has access to the 2026 speed goals of 100/20. 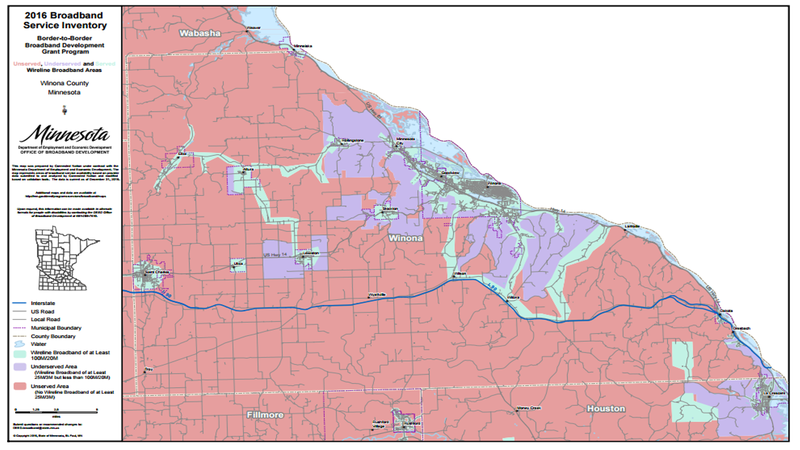 Washington County is in good shape for broadband. The only issue is that they are slipping in access, but the slip is minimal and easy to correct as long as an effort is made. They are part of the Seven-Metro Counties and there are four providers that offer broadband at the speed of the 2026 speed goal: CenturyLink, Comcast HBC and Midcontinent. They have been part of the Metro County Fiber Interconnect discussion – counties making concerted efforts to connect to each other. Washington County is in line to receive $308,683 in CAF 2 funding to upgrade 1374 locations. CAF 2 recipients are only required to upgrade to 10/1 access. Many may choose to upgrade to better speeds but there are no requirements. DDI score of 14.06 out of 100.